The properties of cloud occurrence frequency and cloud water content (CWC) in warm cloud layers (WCLs), mixed-phase cloud layers (MCLs) and ice cloud layers (ICLs) over the Naqu site of the Tibetan Plateau were characterized by using ground-based millimeter cloud radar (MMCR) data and aircraft observations from July 6–31 in 2014. Statistically, the total probabilities of clouds during the 0:00–6:00 (T1), 6:00–12:00 (T2), 12:00–18:00 (T3) and 18:00–24:00 (T4) local standard time (LST) periods were approximately 82.7, 56.2, 55.3 and 65.4%, respectively. The maximum heights of cloud layers under cloudy, drizzle/weak precipitation and precipitation conditions have large differences during T1, T2, T3 and T4 periods. 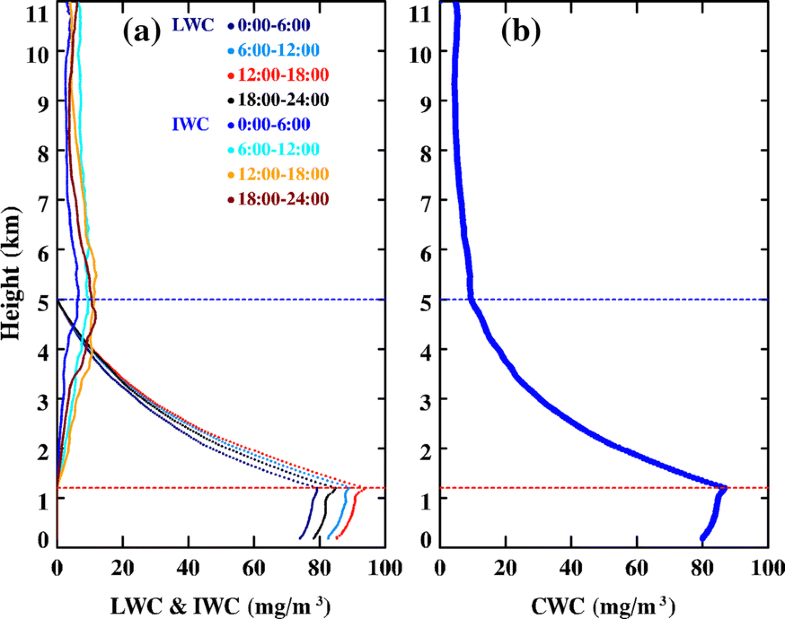 The average values of the retrieved liquid water content (LWC) in the WCLs was approximately 75.2 mg/m3, ranging from high to low during the 4 periods of T3, T2, T4 and T1. The CWC in the MCLs decreased with an increase in height from 86.8 to 9.5 mg/m3, and the mean value was 33.1 mg/m3. The ice water content (IWC) decreased with an increase in height from approximately 9.5 mg/m3 at 5.0 km to 4.8 mg/m3 at 11 km. These results provided unprecedented details concerning the cloud structure and especially about CWC in different phases over the Tibetan Plateau and may be used to improve the parameterization of clouds in various models. 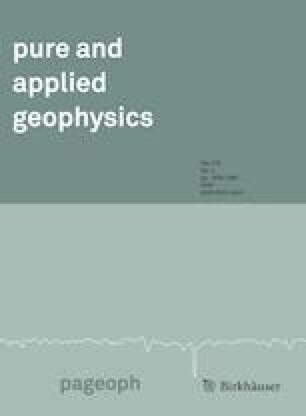 The Tibetan Plateau (TP) exerts profound thermal and dynamic influences on atmospheric circulation due to its complex terrain and unique atmospheric conditions, with an average elevation of 4.5 km above sea level (Yanai et al. 1992; Wu et al. 2007); therefore, it hosts a variety of cloud features and exerts significant effects on the global and regional climate systems (Yang et al. 2014). Although tremendous efforts have been made to obtain information on cloud macrophysics (e.g., cloud cover) and cloud microphysics (e.g., water content) over the TP (For example, Fujinami and Yasunari 2001; Chen and Liu 2005; Li et al. 2006; Taniguchi and Koike 2008; He et al. 2013; You et al. 2014; Zhao et al. 2014, 2016, 2017; Liu et al. 2015), more knowledge of cloud properties based on high-spatiotemporal-resolution observations is always needed to accurately understand the thermal and dynamic effects of the TP on the atmosphere. Recently, based on high-resolution remote sensing data such as the W-band Cloud Profiling Radar (CPR) and lidar, many studies concerning TP clouds have been published (He et al. 2013; Zhao et al. 2014, 2016, 2017; Liu et al. 2015; Chang and Guo 2016; Song et al. 2017). He et al. (2013) analyzed the cirrus cloud geometry and optical characteristics in summer over the TP using micropulsed lidar, and found that there were obvious differences between the TP and other areas at the same latitude. Zhao et al. (2014) analyzed the distribution of the TP total water path (TWP) in clouds and its seasonal variations by using CloudSat data, and found that the value of the TWP during the warm season was greater than that during the cool season, and the vertical distribution of precipitation clouds over the TP was quite different from that over East Asia. Specifically, based on the intensive observations of clouds and precipitation in the third TP experiment of atmospheric sciences (TIPEX III), many studies have provided the properties of clouds over the TP. Liu et al. (2015) carried out research on the microphysical and macroscopic features of clouds and precipitation using multiple-wavelength radar and lidar devices during TIPEX III and found that the statistical parameters of clouds had obvious diurnal variations. Chang and Guo (2016) analyzed the characteristics of convective clouds and the distribution of precipitation and showed detailed daily variations. Zhao et al. (2016) and Zhao et al. (2017) described the microphysical properties of high ice clouds and the microphysical properties of low-level liquid clouds, which provided an effective radius for ice and liquid clouds as well as ice water and liquid water contents. Song et al. (2017) showed cloud occurrence frequencies, cloud base and top heights and diurnal variations by using ceilometer, water vapor and lidar data. The results from the above studies provide the diurnal variations and properties of cloud occurrence frequencies, cloud bases and heights, cloud effective radii and cloud water content (CWC). However, the microphysical properties of clouds in different phases, especially in mixed cloud layers with both liquid and ice phases, still need to be improved, and synthesized information on entire cloud layers also needs to be provided. In this paper, we use the data from outfield experiments over the TP which provide new data for analyzing physical processes of clouds and precipitation over the TP. The vertical structure of cloud macrophysics and microphysics can be provided through the detection using the Ka band millimeter wave cloud radar with high spatial and temporal resolution. We studied cloud structure and water content by dividing cloud layers into different phase layers based on temperature. The results about cloud structure and especially about CWC in different phases over the TP may provide insight into the characteristic properties of clouds and may be used to improve the parameterization of clouds in various models in summer over the TP. Continuous ground-based 35-GHz millimeter cloud radar (MMCR) measurements were carried out in the third TP experiment of atmospheric science (TIPEX III) at the Naqu Meteorological Bureau site (31.48°N, 92.06°E; 4508 m above mean sea level) from 1 July to 31 July 2014. The MMCR can provide resolved information on cloud structures at vertical and temporal resolutions of 30 m and 8.8 s, respectively, by operating in the Ka band with a peak transmitter power of 50 W. The MMCR works in a vertical manner, with a measurement range from 120 m to 15 km. The measurements include radar reflectivity, Doppler velocity, radar spectrum width, depolarization ratio, and power spectra. The effective values of reflectivity range from −50 to 30 dBZ which is suitable for nonprecipitating or weakly precipitating clouds. There are three modes of the MMCR observations, which are the boundary mode (BM), cirrus mode (CM), and rain mode (RM). Zhao et al. (2016) and Zhao et al. (2017) retrieved the liquid water content (LWC) of low-level liquid clouds using the BM and the ice water content (IWC) of high ice clouds using the CM. Here, we retrieved the LWCs of liquid clouds and mixed-phase clouds and the IWCs of mixed-phase clouds and ice clouds by using the BM and CM, respectively. In addition, aircraft observations were conducted as part of the TIPEX III project (see Fig. 1). The aircraft data were used to verify the retrieval of LWCs in clouds by using the MMCR data. The data were selected in the region 31–33°N, 91–93°E (see Fig. 1a). The aircraft flew several runs at different altitudes from 1.8 to 4.5 km and measured the LWC and temperature (see Fig. 1b, c). A summary of the aircraft maneuvers during the flight is provided in Table 1. The LWC data are derived from measurements using the Nevzorov probe. First, we classified the cloud layers as warm cloud layers (WCLs), mixed-phase cloud layers (MCLs) and ice cloud layers (ICLs), which are characterized by phases of pure liquid, liquid and ice (i.e., mixed) and pure ice, respectively. The cloud phase was related to the status of the atmospheric temperature. Based on the radiosonde and MMCR observations at a specified height, Zhao et al. (2016) and Zhao et al. (2017) assumed that clouds above 5 km were composed of in-phase pure ice and those below 1.2 km were composed of in-phase water, which was consistent with the aircraft observations presented in Fig. 1c [see the reference from Zhao et al. (2018)] and the findings by Liu et al. (1999). We assumed the cloud layers below 1.2 km to be WCLs, the MCLs to be between 1.2 and 5 km, and the ICLs to be above 5 km based on the results of Zhao et al. (2016) and Zhao et al. (2017). Note that the height in this paper refers to the altitude above ground level. Second, by considering the effects of different reflectivity values on the average reflectivity value, the whole MMCR reflectivity range (from −50 dBZ to 30 dBZ) was divided into 16 equal sub-ranges (i.e., the first range was from −50 to −45 dBZ, and the sixteenth range was from 25 to 30 dBZ). 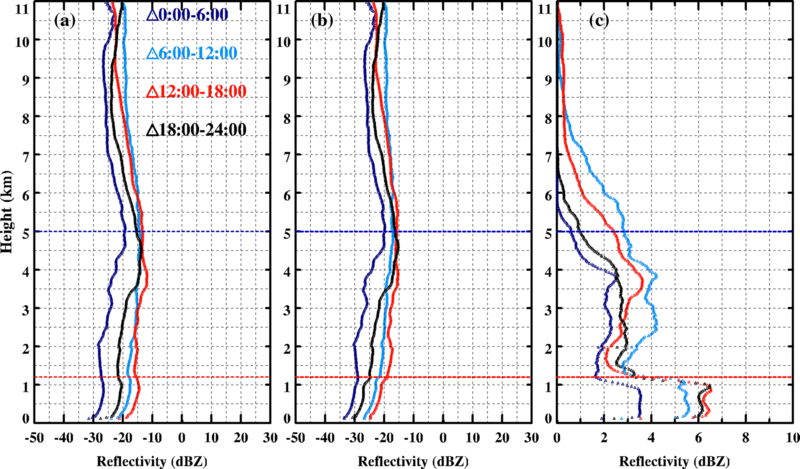 The probabilities of different reflectivity ranges were determined in four 6-h periods during 1 day from 0:00 to 6:00 local standard time (LST; i.e., the T1 period), 6:00–12:00 (T2), 12:00–18:00 (T3) and 18:00–24:00 (T4). Note that the MMCR observations were operated in the boundary mode to detect low-level boundary layer clouds and fog events with weak reflectivity and small Doppler velocity below 2.04 km; these observations were also operated in cirrus mode, which is sensitive at heights between 2.04 and 15.3 km. By considering the continuity of a cloud in terms of vertical height, the probabilities of reflectivity in boundary mode and cirrus mode at a 2.04-km height were set as equal values and smoothed below 2.04 km. Thus, the mean reflectivity profiles in the different periods during 1 day were calculated based on the probability distribution functions (PDFs) of the clouds. Finally, the LWC of clouds was retrieved based on the forward model algorithm and by assuming a log-normal size distribution (Austin et al. 2009). The number density of the cloud droplets was assumed to obey a logarithmic normal distribution function, as shown in Eq. (1). where R represents the particle size of the cloud droplet, N(R) represents the number density for a particle size of R, NT represents the total number density, Wg represents the standard deviation, and Rg represents the geometric average radius. Equation (1) can be used to derive the relationships among the LWC, radar albedo factor (Z), NT, Rg, and Wg, as shown in Eqs. (2)–(3). where ρw represents the cloud droplet density. During the retrieval process, we need to set a vector of the prior values for NT, Rg, and Wg, which form a prior value vector (xa) and a covariant matrix of prior values, Sa. The optimal retrieval solution is determined by the iterative convergence of Eq. (4). In Eq. (4), y represents the measured value of different height levels for Z, and F(x) represents the first-order derivative of various cloud layers for Z, which can be derived by taking the derivative of Eq. (3). In Eq. (5), z1 and zp represents the heights of the cloud top and cloud base, respectively. Details of the retrieval algorithm used here can be found in Austin et al. (2009), Qiu et al. (2015), and Qiu and Lu (2016). In addition, when retrieving the LWC in the MCLs, only liquid water was first assumed in cloud layers and retrieved, then the LWC was multiplied by the liquid water-to-ice water mixing ratio to derive the final LWC. 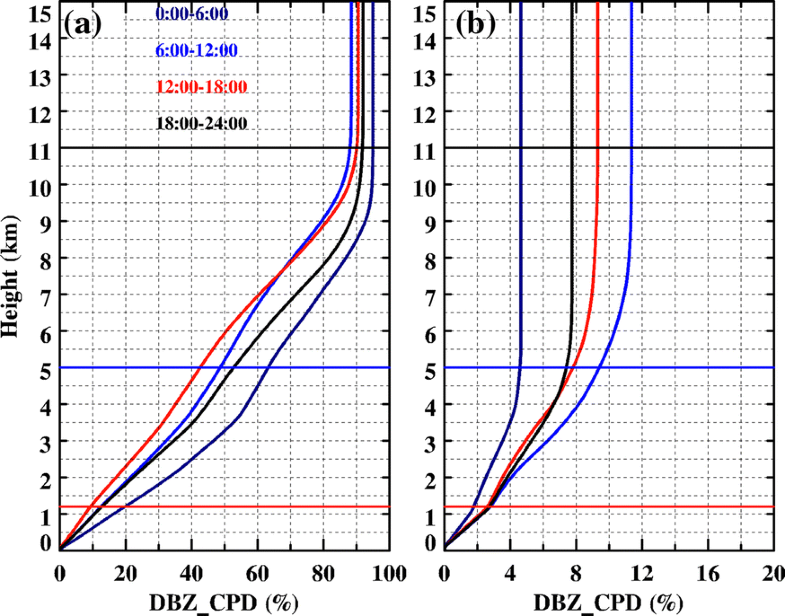 The liquid water-to-ice water mixing ratio p1 in the MCLs was calculated according to Eq. (6), as per Austin et al. 2009, which has been used to produce the CloudSat 2B product. In Eq. (6), T, Tmin, and Tmax represent the average, minimum, and maximum value of temperature in cloud layers, respectively. Qiu et al. (2015) suggested the liquid water-to-ice water mixing ratio p2 based on Eq. (7) was more appropriate than p1 in Eq. (6) in the MCL. Here, Eq. (7) was used. To obtain the column-averaged CWC of the whole cloud layers, the IWCs were retrieved based on an empirical function provided by Zhao et al. (2016) who used the same MMCR data, based on Eq. (8). where Ze is the radar reflectivity. The cloud probability distributions (CPDs) were presented based on the radar reflectivity statistics in July of 2014 (see Fig. 2). Statistically, the PDFs for the whole cloud layer during the four periods showed two peak areas. 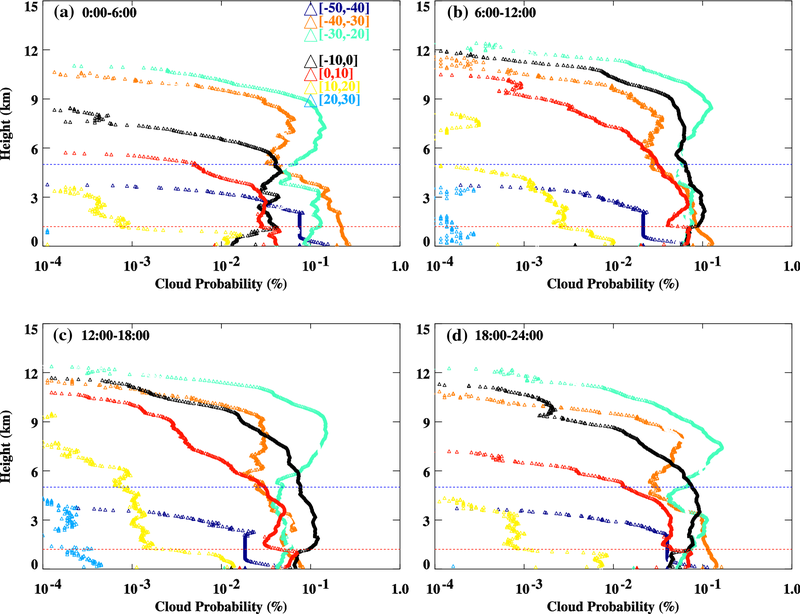 The probabilities of whole cloud layer during T2, T3, and T4 are distributed in the two peak areas while the probabilities are mainly concentrated in the first peak area during T1. The first peak area occurred in reflectivity ranges below −15 dBZ and the second peak area occurred above −15 dBZ. A reflectivity value of −15 dBZ found via the 35-GHz cloud radar was suggested as a reference value for drizzle and weak precipitation occurrences (Fox and Illingworth 1997; Matrosov et al. 2004; Suzuki et al. 2010). Reflectivity in ranges of less than −15, from −15 to 0, and 0 to 15 dBZ were interpreted as corresponding to cloud, drizzle/weak precipitation, and precipitation, respectively (Suzuki et al. 2010). This implied that the total probabilities of clouds in T1, T2, T3, and T4 were 82.7, 56.2, 55.3, and 65.4%, respectively; these are 6.5, 1.7, 1.6, and 2.4 times greater than the drizzle/weak precipitation probabilities, and 17.7, 4.9, 5.9, and 8.4 times greater than the precipitation probabilities, respectively. From the contrast between cloud and precipitation probabilities in T1, T2, T3, and T4, it shows the clouds that occurred from 0:00 to 6:00 were more significant than those that occurred under drizzle and precipitation conditions, which appeared most frequently from 12:00 to 18:00. This was related to the diurnal variations in water vapor. Intense sensible heating over the TP in summer provides thermodynamic conditions for the development of convective activities on the plateau. The boundary layer reaches the highest temperature in the afternoon and higher temperature in the evening, which leads to the instability of the stratification over the plateau and the increase of the large-scale updraft, which is beneficial to the convective activity and the occurrence of precipitation. Sato et al. (2008) studied clouds over the TP with a mesoscale model and showed that the black body temperature of clouds reached large values from 13:00 to 20:00 during the daytime. Fu et al. (2006) found that summer rainfall reached its maximum value at approximately 16:00 and a minimum at approximately 5:00. In addition, the lower atmosphere is mainly dominated by convergence airflow over the TP from noon to the evening in summer. The rising movement and relative humidity are stronger than those from night to dawn, which is beneficial to the occurrence of precipitation. The divergence mainly appears during the evening and the early morning and the clouds do not develop easily into precipitation (Chang and Guo 2016), which is in accordance with the statistical results in Fig. 2. As shown in Fig. 2-a, the highest probability under the cloud condition in the first peak area appears in T1, and the highest probability under the drizzle and precipitation condition appears in T3. Based on the TIPEX III data, Chang and Guo (2016) found that there is a significant diurnal variation on the process of convective clouds and precipitation. Convective activities are developed by local geothermal convection at 11:00 (LST) and reaches their strongest activity from 17:00–18:00; convection, then weakens to dissipate at night and there is less convective activity in the morning. The probabilities of cloud, drizzle/weak precipitation, and precipitation in different phase cloud layers showed significant differences, as shown in Fig. 2b–d. In the WCLs, cloud probability that occurred in the first peak area during T1, T2, T3 and T4 were 83.7, 58.6, 50.2 and 66.5%, which were 5.1, 1.4, 1.0 and 2.0 times greater than those that occurred in the second peak area, respectively. This means that drizzle and precipitation occurred most frequently from 12:00 to 18:00 during the daytime which is consistent with the findings in the literature (For example, Fu et al. 2006; Sato et al. 2008; Bai et al. 2008; Chang and Guo 2016), and the frequencies of these conditions were comparable to the cloud frequencies. In the MCLs, clouds that occurred in the first peak area were 79.0, 49.8, 41.6 and 57.6% during T1, T2, T3 and T4, respectively. This implied that the drizzle and precipitation conditions during the daytime were consistent with the occurrence of clouds, and the frequency of clouds at nighttime was greater than the frequencies of drizzle and precipitation of approximately 3.8 and 1.4 times from 0:00 to 6:00 and 18:00 to 24:00, respectively. That is, drizzle and precipitation mainly occurred during the daytime, which is consistent with the results of Sato (Sato et al. 2008). In the ICLs, the cloud frequency showed a unimodal distribution that was focused over cloudy areas, with proportions of 87.6, 62.1, 67.5 and 74.1% during T1, T2, T3 and T4, which were 7.2, 1.9, 2.3 and 3.0 times greater than those of drizzle and precipitation, respectively. This means that less drizzle and precipitation occurred in the ICLs than in the WCLs and MCLs. Figure 3 shows the vertical profiles of cloud probability for four 6-hour periods during a day in eight sub-ranges of reflectivity. The maximum heights (MHs) of the cloud layers (Fig. 3) during the four periods appeared to have large differences, which were affected by surface thermodynamic conditions. The MHs under cloudy condition during T1, T2, T3 and T4 were approximately 10.9, 12.5, 12.4 and 12.4 km, respectively. The MHs under drizzle conditions were approximately 8.5, 12.1, 11.9 and 11.5 km during T1, T2, T3 and T4, respectively. This implies that the MHs under cloudy and drizzle conditions from 0:00 to 6:00 were lower than those during other periods, which may be due to the fact that the stable boundary layer in T1 was affected by the thermal dynamic diurnal cycle (Yanai and Li, 1994). Moreover, the MHs under precipitation conditions showed large differences during the daytime and nighttime periods. The ranges from 0 to 10 dBZ, 10 to 20 dBZ and above 20 dBZ corresponded to precipitation conditions with a low reflectivity value range (LRVR), medium reflectivity value range (MRVR) and high reflectivity value range (HRVR), respectively. The MHs under precipitation conditions in the LRVR reached 10.9 and 11.0 km during T2 and T3, and 6.5 and 7.4 km during T1 and T4, respectively. The MH in the MRVR reached a 6.9- and 9.8-km height during T2 and T3, 4.0 km during T1 and 4.6 km during T4 at low levels at nighttime. The probability of a HRVR mainly appeared during T2 and T3, with MHs approximately 4.0 km and 4.7 km, respectively. The MHs during the daytime periods, especially during T3, were higher than those during the nighttime periods, which was related to the thermal dynamic features. That is, the diurnal variations in the thermal dynamics over the TP were significant, as convection in the boundary layer began to develop at 9:00 LST, increase sharply at 12:00 and reach a maximum at 15:00 (Fujinami and Yasunari 2001; Yang et al. 2004). As shown in Fig. 4a, there are two layers where the probability under cloudy and drizzle conditions increased greatly with increasing height. One was the layer below 3.5 km, and the other was the layer from 6 to 9 km. Less clouds appear above 9 km which is affected by humidity inversion (Chang and Guo 2016). The humidity inversion makes less clouds and then inhibits the development of convection over the TP. The probability under precipitation conditions increased greatly only in the layers below 3.5 km (see Fig. 4b). The cumulative probabilities at the 3.5-km layer during T1, T2, T3 and T4 reached 56.5, 44.5, 36.9 and 46.3%, respectively. It is shown that clouds below 3.5 km occurred more frequently at night than during the day. Moreover, the cumulative probability of the whole reflectivity range increased minimally in the 4–5-km layer. This indicates that clouds occurred less in the 4 to 5-km layer, which is consistent with the findings of Liu et al. (2015). The cumulative probabilities at a 9-km height during T1, T2, T3 and T4 reached 97.4, 90.8, 90.4 and 96.0%, respectively. This indicated that ice clouds occurred at a less than a 10% rate above the 9-km layer. Considering that probability above 11 km was less than 0.5% for the 4 periods, we focused our research on the layers below 11 km in the following analysis. To give an expression for information concerning the average cloud reflectivity, mean reflectivity profiles were calculated based on frequency spectrum profiles for 16 sub-reflectivity categories (see Fig. 5). The calculated reflectivity based ,on the frequency spectrum can reflect the comprehensive cloud level, which eliminates the influence of high values of reflectivity on the total mean value. Figure 5a provides the average values of the calculated reflectivity by considering cloudy, drizzle, and precipitation probabilities together, and Fig. 5b shows the calculated reflectivities by only considering the cloudy and drizzle probabilities. The reflectivity profiles had a similar trend with height during the four periods, but the values of reflectivity showed large differences in Figs. 5a, b, which appeared significantly in the WCLs that were related to the large values of reflectivity under precipitation conditions (see Fig. 5c). Statistically, the reflectivity profiles that only considered nonprecipitation clouds in Fig. 5b were more reasonable than those in Fig. 5a. In general, the values of the reflectivity profiles during the daytime periods were larger than those during the nighttime periods in the WCLs and the MCLs and exhibited an increasing trend with an increase in height. The values of reflectivity during T1 were the smallest, and the values during T3 were the largest of the four periods when orographic or convective clouds existed (Chen et al. 2012; Wang et al. 2015). The reflectivity profiles in the ICL showed a decreasing trend with increases in height. The LWCs and IWCs provided in Fig. 6 only include cloudy and drizzle conditions without considering precipitation condition. As shown in Fig. 6a, the LWCs in the WCLs increased with height from approximately 80.1 mg/m3 at 0.12 km to 85.5 mg/m3 at 1.2 km, which is consistent with the findings of Li and Ligeer (2001), who studied in situ aircraft observations over the northeastern TP. Zhao et al. (2012) and Zhao et al. (2017) also presented similar results. The reason is that as air masses expand, lose energy and become cold, moisture condenses into liquid water, which makes both the cloud droplet size and LWC increase as the air mass moves upward. Sharp changes in the linear slopes of the LWC at the upper levels in the WCLs may be caused by relatively stronger air exchanges between the internal and external regions of upper-level clouds. The LWCs were ordered from high to low as follows: T3, T2, T4 and T1. 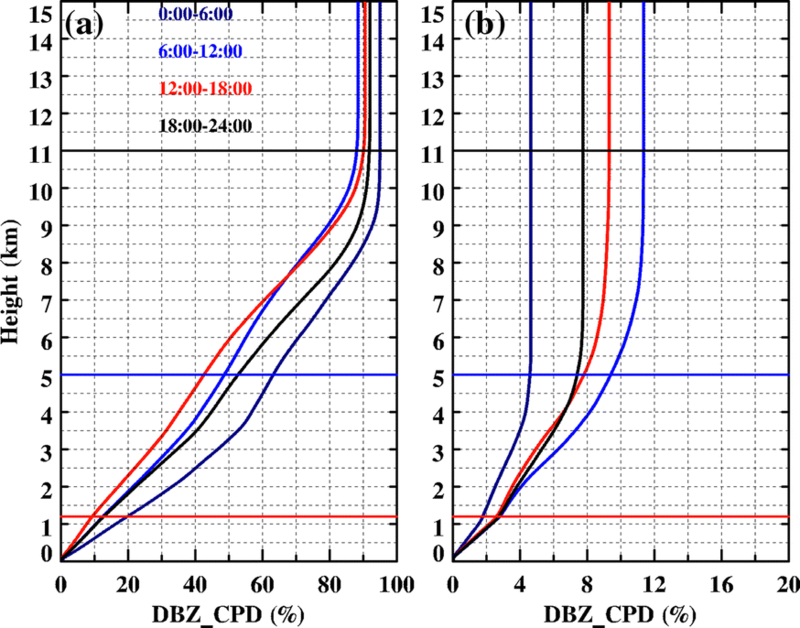 The LWC (IWC) in the MCLs decreased (increased) with increasing height, which followed a roughly exponential function, and was related to the corresponding temperatures used in the retrieval process. Specifically, the LWC appeared to have a sharp decrease at 1.2 km because the LWC in the MCLs was multiplied by the liquid water-to-ice water mixing ratio to derive the final LWC, and the liquid water-to-ice water mixing ratio decreased with height according to the exponential function for temperature. The order of the average LWC values in the MCLs from high to low was T3, T2, T4 and T1. Zhao et al. (2016) retrieved the IWC by using the same MMCR observation data, and we quoted their IWC retrieval method here. The IWCs in the ice layers decreased weakly with increasing height, going from approximately 9.5 mg/m3 at 5.0 km to 4.8 mg/m3 at 11 km. The values of the IWC in every ice layer during T1 were the smallest of the four periods. We then analyzed the diurnal variations in monthly average LWC and IWC in different phase layers in more detail. Figure 6 shows the overall diurnal variations in LWC, IWC and CWC in July 2014 over the TP. The monthly mean LWC in the WCLs was approximately 75.2 mg/m3, which is comparable to that of Zhao’s (Zhao et al. 2017). A relatively weak maximum LWC occurred in the early morning (see Fig. 7a). On the other hand, by considering the LWCs in the WCLs and MCLs together, the diurnal characteristic properties of LWCs showed a significant maximum value at approximately 14:00–16:00 (see Fig. 7d). 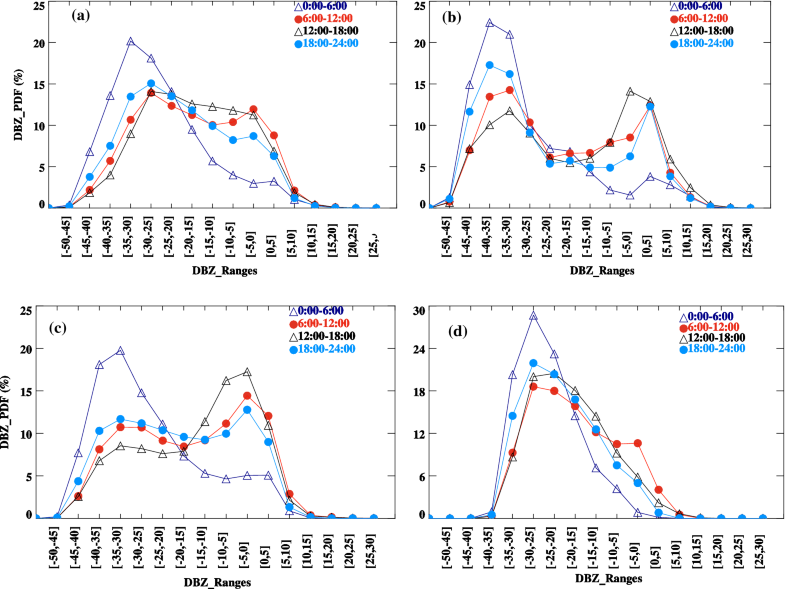 The diurnal variations in the LWC were influenced by the diurnal solar radiation cycle and thermodynamics (Chang and Guo 2016). The diurnal variation in the LWC, with a maximum peak occurring during the afternoon and a minimum value that appeared during the period before sunrise, confirmed the control of surface thermodynamics on cloud formation over the TP. Li et al. (2008) pointed out that the total precipitation has a dominant peak at approximately 18:00 LST and a secondary maximum at approximately 3:00 LST. The average LWC and IWC values in the MCLs showed clear diurnal characteristic properties. The LWCs and IWCs reached maximum values at approximately 14:00–16:00 and minimum values at approximately 4:00–6:00 (Fig. 7d, e, respectively). The average LWC was approximately 26.6 mg/m3, which was similar to the average values of the aircraft observations (see Table 1). In addition, the average IWC was approximately 6.5 mg/m3. Above all, the diurnal variations in the CWC below 11 km appeared to have clear diurnal characteristic properties, with a maximum value of 26.1 mg/m3 at approximately 14:00–16:00 and a minimum value of 17.6 mg/m3 at approximately 4:00–6:00. We should note that the CWCs (or LWCs and IWCs) in Fig. 7 were averaged within the corresponding layers; the cloud water path (CWP) can be obtained by multiplying the CWC by the thickness of the corresponding layer. From Fig. 7c, we can obtain the monthly average CWP below 11 km, which was approximately 0.3 kg/m2. 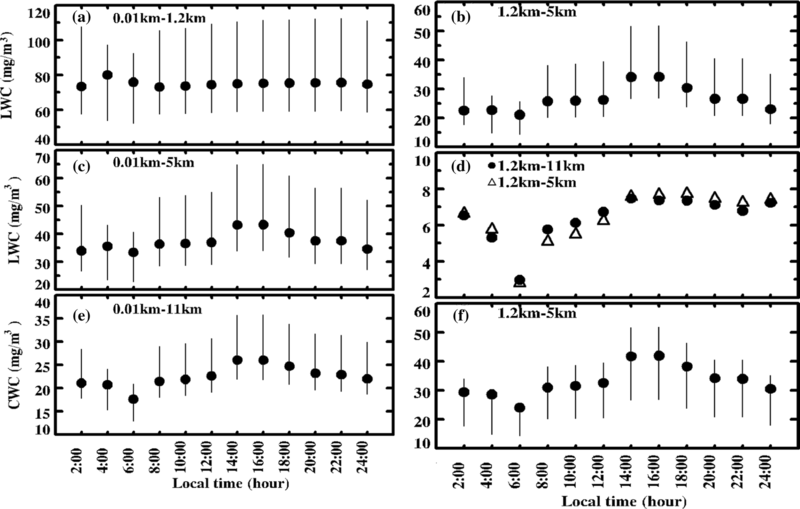 The frequency of cloud occurrences at 0:00–6:00, 6:00–12:00, 12:00–18:00 and 18:00–24:00 LST were approximately 4.8, 1.3, 1.2 and 1.9 times greater than the frequencies of drizzle and precipitation, respectively. Compared with cloudy conditions, drizzle and precipitation conditions appeared frequently in the WCLs and MCLs at 12:00–18:00 and less frequently at 0:00–6:00 throughout the whole cloud layer. Clouds attained a maximum height of approximately 12.5 km during the daytime period. Drizzle/weak precipitation can reach a maximum height of approximately 12.1 km from 6:00 to 12:00, but can reach only 8.5 km from 0:00 to 6:00. Precipitation with low reflectivity reached a maximum height of 7.4 km at night and 11.0 km during the daytime, and precipitation with large reflectivity reached a MH of 4.7 km mainly during the daytime. The cumulative probability below 3.5 km and between 6 and 9 km increased greatly with increases in height. The probability below 3.5 km was approximately 46.1%. The cumulative probabilities were approximately 93.7% at 9 km and 99.6% at 11 km. The reflectivity profiles calculated based on the frequency spectrum profiles showed an increasing trend in the WCLs and MCLs and a decreasing trend in the ICLs with an increase in height. The values of reflectivity from 0:00 to 6:00 were the smallest during the four 6-h periods for every cloud layer. The mean LWC was approximately 75.2 mg/m3 in the WCLs and 26.6 mg/m3 in the MCLs. The mean IWC above the WCLs was approximately 6.4 mg/m3. Above all, the mean CWC reached a maximum value of 26.1 mg/m3 at approximately 14:00–16:00 and a minimum value of 17.6 mg/m3 at approximately 4:00–6:00. We would like to acknowledge the support of the Third Tibetan Plateau Experiment of Atmospheric Science (TIPEX III) for providing the data. This study was funded by the National Key Research and Development Program on Monitoring, Early Warning and Prevention of Major Natural Disaster (2017YFC1502103), the National Natural Science Foundation of China (grant no. 41475035, 91537108); and China Meteorological Administration Special Public Welfare Research Fund (grant no. GYHY201406001); and the Natural Science Foundation of Jiangsu Province of China (grant no. BK20160041).